Three grisly murders thrust the best friends into a generations-old conspiracy of biblical proportions. From New York to Rome to the inner sanctum of the Vatican, Manny and Grace race to untangle a bizarre mystery surrounding the controversial artifact. Their discovery could alter the course of human history…..if they live to tell. The gaping wound in her side made every movement, every breath, more painful than the last. Crimson stained her bare feet, and the remnants of her screams echoed, but no lights beckoned from the shuttered buildings she passed. Not a single soul responded to her pleas for help. Rain beat a tattoo on rooftops and into puddles, drowning out all other sounds, so that only she and the feral-scented pursuer seemed to exist this night. Someplace behind her, his heavy boots slapped the cobblestones. From a dark street, she slipped into an even darker alleyway and behind trash bins. The rain intensified, pounding the metal cans and pouring from the downspout by her feet. A red neon sign overhead made the discharge look like a river of blood. Her whole body jerked at the sound of clinking glass and slurred voices rising above the rain’s steady drum. The silhouette of two young men swayed down the alleyway, no more than fifty meters away. Hoping to get their attention and beg for help, she slid out from behind the metal bins, stopped by something both sinister and familiar that passed through the darkness between them. She recoiled and then turned and ran, the wet fabric of her tunic clinging to her burning thighs. Out of the night, church bells tolled, and the rain stopped. She spun toward the familiar sound. Storm clouds had scattered to reveal an open piazza at the end of the dark and narrow street. She gathered her tunic above swollen ankles and hurried toward it, pausing at the entrance to the open space. Across the piazza, a dim light filtered out through stained glass windows. Grazie, Dio! Thank you, God! At the top of the stairs, she looked back and saw no movement, heard no sound. Her arthritic hands fumbled with the door’s iron latch. As it gave way, thunder rumbled. Startled, she peered over her shoulder to see plumes of warm breath that wafted from a still black form lurking in the shadows. O Dio, O God. She quickly leaned into the heavy wood door. The rusty hinges gave way, and she stepped through, slid the bolt in place behind her, and slumped against the door, her breath coming in halting gasps. The air inside, redolent of oils and incense, felt thick and damp. In the distance, a small rack of votive candles interrupted the shadows, giving the space an unearthly glow. Her wrinkled hands guided her along the wall toward the flickering light as her eyes struggled to adjust. Instead of the flat surface she expected, her fingers traveled over an odd jumble of smooth contours and rough edges. The walls came into slow focus, and her heart skipped a beat. A desperate scream lodged in her throat, choking her. She tried desperately to sort shadows from reality as her gaze darted back and forth. It couldn’t… Those couldn’t be human remains. Skulls . . . bones . . . thousands of them lining the walls. Where was she? What horror had she come upon? She could almost hear the wails of the souls trapped deep inside. She turned back toward the horrific vision, because she remembered it now. Santa Maria della Concezione, the storehouse for the bones of Capuchin friars dating back to the fifteenth century. She lowered her head and hurried toward the candlelight, her calloused fingers traveling along the worn rosary beads. The candle’s light revealed the base of a circular staircase. She climbed into the nave and, thanks to a flash of lightning, avoided knocking over a holy water font hidden in the darkness. Her fingers dipped instinctively. Closing her eyes, she made the sign of the cross, invoking the Father, Son, and Holy Spirit, before stumbling into a pew to catch her breath. In the stark silence of the church, a tiny noise coaxed her out of her trance. She fell to her knees between the pews, ignoring the rush of pain from the hard marble floor. Faint footsteps advanced. A man hummed, random notes that soon merged into a familiar melody, one whose lyrics she had known since her childhood. “Amazing Grace,” he sang softly. “How sweet the sound.” Both footsteps and words grew louder. “That saved a wretch like me.” Then silence but for the steady throb of her heartbeat in her ears. She peered over the top of the pew and spotted a confessional across the aisle. She crept forward, struggling to silence the creak in her bones and the sound of wet fabric swishing along the marble floor. The aisle was empty. She eased forward into the penitent’s side of the confessional booth, pulling the door behind her and sliding the privacy latch quietly in place. She stumbled and fell, hitting her head against the back wall. The privacy door slid open from the priest’s side of the booth as she lay crumpled in the corner. Her mouth tried to form words but all she could manage was chattering teeth. Without warning, the metal privacy screen between the two booths exploded outward. She tried to shout, struggling to unleash a scream that would wake the dead around her. But a powerful hand muffled her cry as it squeezed the life from her frail body. His eyes flared into a fiery red. With each step, the line narrowed, the crowd pressed in, and the velvet rope edged closer. Elbows jabbed his back, his sides, his front. He gagged at the sour medley of cologne and sweat. Voices blurred until the background noise sounded like the scratch of a needle at the end of a record. Why had he picked a Saturday to see the exhibit? As he pressed his fingers to his temples, Immanuel Lusum whispered a prayer under his breath and felt Grace slide her hand up his spine. At her touch, the muscles in his back eased slightly. He closed his eyes, focused on the movement of her fingers, and sucked in a deep breath even as he counted the beats. In, one. Out, two. In, three. Out, four. “Where are you?” Grace asked. Manny inhaled and exhaled once more for good measure and then opened his eyes to the bright lights of the museum lobby. As soon as Grace removed her arm, he started bouncing on the balls of his feet. Another deep breath, another touch from Grace, and he was able to still his body. Her breath blew on his cheek, and gooseflesh flared. She didn’t move away. His heart sped as she brushed her fingertips across his jaw. He should have shaved. “Did you find your happy place?” she asked. “Another Shroud exposé?” she asked. Manny pulled a large, leather-bound volume out of the crook of his elbow and stared at it as if for the first time. It looked much older than the elderly man selling tickets. It looked older than New York City for that matter. Grace leaned over to peer at his wallet, at her picture under plastic. He’d taken it in Battery Park over a year ago. Thanking the clerk, he steered Grace up the wide center staircase to the second level. Moving, focusing, he could deal with the close spaces and the masses of humanity. But it wasn’t until the crowd thinned at the top of the stairs that his heart began to find its normal rhythm. They followed an elderly couple down a wide corridor lined with abstract artwork. “Shush.” He scanned the area. “For some reason,” he said, trying to ignore the subtle scent of lilac wafting up at him, “the Vatican doesn’t allow the public to photograph the Shroud. Ever. I want to know why. He led her back into the gallery area and gestured toward a corridor on the right and an arched entryway, taking her hand as they passed the placard announcing The Shroud of Turin. “Not to mention the enormous security guard.” Grace gestured over his shoulder. He turned to see the big man in blue wearing a shiny security badge. “Let’s take a closer look.” Concentrating ahead and not on the crowd, he edged into the room and squeezed past the curious to within ten feet of the famed artifact. The Shroud was mounted horizontally in a glass case on the wall and separated from the crowd by another velvet rope, this one thick and gold, supported by shiny gold stanchions. The Shroud of Turin. Manny felt an instant communion with the infamous relic. Whether the feeling was real or self-induced from years of research, an itch that bordered on déjà vu caused him to tremble. He focused on the display pedestal and the words in front of him. The Shroud of Turin, the most controversial and studied religious artifact in history, is believed by some to be the actual burial shroud of the Christian deity, Jesus of Nazareth. 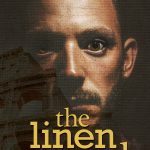 Although carbon dating places the origin of the linen cloth in the sixteenth century, many Christians believe the Shroud is much older, dating back to the first century. “Probably the Vatican. They’ve never actually vouched for its legitimacy. Maybe that’ll be different in a few years.” If he had anything to say about it, it would. “How many times do I need to tell you, it’s not an outfit?” He adjusted the white Roman collar around his neck and smoothed wrinkles out of his starched black shirt. Even when she made fun of him, Grace was still a delight. He shook his head. That familiar rush washed over him. He pushed it away. Soon-to-be priests weren’t supposed to have those kinds of thoughts. One of her brows hiked. Manny nodded. He would go to the ends of the earth for her anyway, deal or no deal. He watched the sway of her hips as she threaded her way toward the entrance. She fit her hair into a ponytail as she walked, looking over her shoulder as she got in position. His King James was in his hand, ready to go. He made a show of looking at his wristwatch before glancing at the guard. And then he nodded toward her. Grace immediately let out a gasp and fell to the floor. An elderly woman screamed. The entire crowd parted like the Red Sea, providing Manny with a front-row view of the show. Rather than following his simple script, she writhed around for a few seconds, let out a loud groan, and wilted into a mound. Manny fought the urge to laugh. After the burly guard did a quick assessment, he grabbed a walkie-talkie from his belt and lumbered towards the commotion. Manny removed the camera, raised it to his eye, and snapped several photos before rushing to see how he could comfort the poor, helpless woman.